Awesome Friday! » Blog Archive Review: A Quiet Place - Awesome Friday! In fact, if you are the kind of cinemagoer who does not do well with jump scares, then A Quiet Place may be too much for you. The fear here does build and simmer, but at its peak, Krasinski leans on jump scares a little too hard. However, saying that, you should remember that there’s nothing wrong with good jump scares, and these happen to be great. Actually, you could level that comment at the whole film; it’s hard to believe this is Krasinski’s first film, such is its depth and framing. Following a single family in one location, apart from being an easier budgetary proposition, is a narrative masterstroke here. The farmhouse and surrounding fields frames what is basically the film’s One Bad Night, giving every beat an edge of Hitchcockian goodness. If Hitchcock had decided to direct Pitch Black. It helps here that the casting of the family is wonderful, and their reaction to the horror surrounding them sells the fear to the audience. It certainly helps that Krasinski cast his real-life wife as his on-screen wife, which, when you’re married to Emily Blunt, is A Very Good Move. It goes without saying that the two adults have an incredibly soft on-screen chemistry, but it’s Blunt’s performance that will stay with you. It’s a typically great turn from her, and her last shot is an instant classic. The children, too, are perfect. They’re great for a couple of reasons – as a father, you get used to recognising real fear, and it’s often not the showy screaming of many mainstream movies. It’s quieter, a cracked voice and a fearfulness in the eyes, used to great effect here (and very moving as a result). Secondly, Krasinski chose an actual deaf actress – Wonderstruck‘s Millicent Simmonds – as the daughter; aside from the obvious bonus of watching a great performance from a a member of an under-represented screen demographic, the sound design expertly focuses of the types of silence she hears to amp up the tension even more. One of the many deft touches of the film is to not over-explain its setup, Within the first ten minutes, you know there are monsters, most people have been killed, and the monsters hunt through noise alone. We never find out what they are, or how they got here, and it’s all the more better for it. And, with one exception, we never meet anyone else – this is a film about a family dealing with its own issues, as well as those lurking outside. On the directorial side, there are some visual elements that are lingered on a little too much; some initial clues are obvious loaded guns, ready to be used in the third act. Also, the aforementioned twenty minute section in the second act is so tense and effective, the rest of the film has too big a task to match it. Perhaps a more experienced director might have hidden these clues a little better in the background, weighted the tension a little more towards the final act. However, it’s ultimately not enough to tarnish the overall experience. 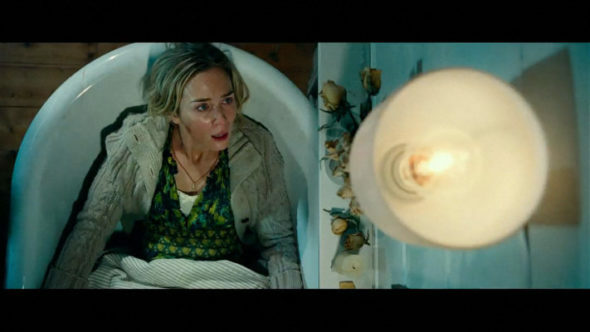 A Quiet Place is the kind of film you must see in theatres – rich, creative and original, it is a wonderful bottle movie that will drag you through some true horrors before giving you the means to fight back. It’s a revelation from Krasinski as an actor and director, and hopefully heralds the beginning of a long career full of more scares.